Planned Parenthood turned on their former ally Sen. Susan Collins (R-ME) Friday after she announced that she will be voting to confirm President Trump’s Supreme Court nominee Judge Brett Kavanaugh despite the eleventh hour sexual misconduct allegations against him. The nation’s largest abortion provider declared that Collins can “no longer call herself a women’s rights champion” due to her decision. In her speech, Collins concluded that since Dr. Christine Blasey Ford, the woman accusing Kavanaugh of sexual misconduct, had named four witnesses who could not corroborate her account she did not think Ford's claims met a "more likely than not" standard. this is a betrayal of women. this is a betrayal of people everywhere. Planned Parenthood has heavily praised Sen. Collins in the past due to her status as a self-declared “pro-choice” Republican, particularly when she voted against the skinny repeal of Obamacare in July 2017. In her explanation of her vote, Collins specifically cited the need to protect Planned Parenthood funding. Every year, 10,000 Mainers come to Planned Parenthood for health care. Without Planned Parenthood, many of these patients would have nowhere else to go. 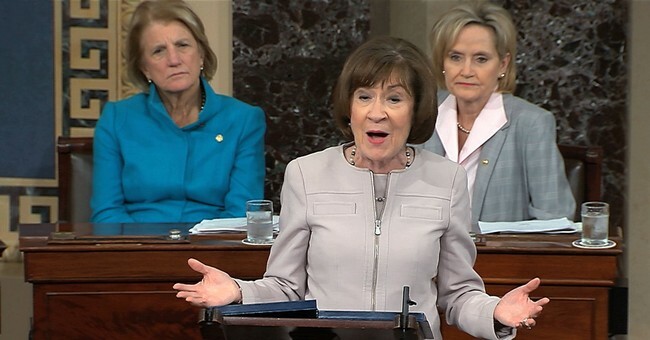 Despite the abortion groups' current strong language against her, Collins was even careful during her announcement of her vote on Kavanaugh to emphasize that she did not believe he would overturn Roe v. Wade as abortion groups fear. She cited her own conversations with Judge Kavanaugh on the topic. However, Planned Parenthood is pushing for Supreme Court nominees to affirm Roe v. Wade rather than simply regarding it as settled precedent as nominees have done in the past. They also threatened Thursday to come after the senators who voted to confirm Kavanaugh.